Thanks for all the kind words about the newest trailer. It’s awesome that we were able to finally say “this is the show” in such a definitive way. Hopefully it’s got you guys pumped. I’ve been excited about this trailer for awhile, but in particular the shot at the end. When I write episodes, I try not to put in too much “direction” in the scripts, because that’s Daniel’s department. 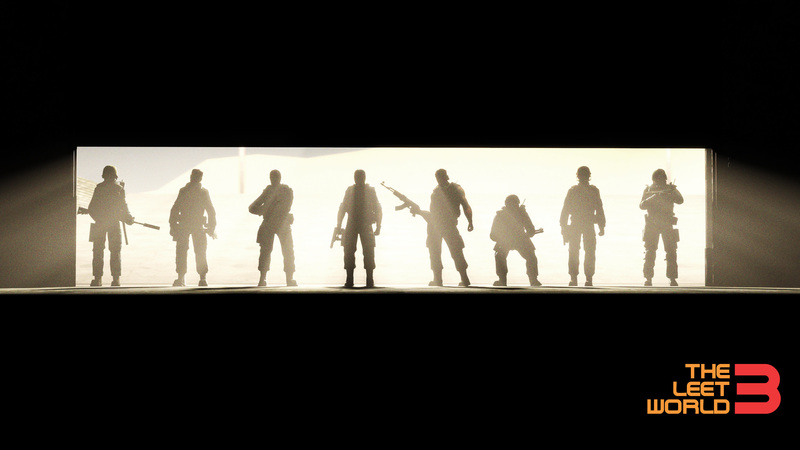 However, when I came to the moment in an unnamed episode when all of the characters would be standing at a garage door in the desert, I requested only that it be framed as an epic silhouette shot with all of our dudes. For obvious reasons. I also knew that we would ultimately have to use this in a trailer, because it’s great. Anyway, because it’s so great, we thought we’d gift it to you in the form of a Leet World Season 3 wallpaper. Enjoy. This entry was posted in News on June 3, 2015 by Eddy. Hey everyone! We’ve got a new vlog update about the status of Season 3, plus a couple of ways that you can help us out over the next week or so. The first of which is the imminent teaser. We’d love for you guys to share the teaser when it comes out so we can let as many old fans as possible know that the show’s coming back. The other big news is that we just put a TLW sticker up in the CSGO workshop! If we’re fortunate enough for this sticker to get voted into the next CSGO update, it would be a really huge deal for us in terms of getting help with production funds and just continuing to spread the word about Leet World. If you can, do us a favor and go vote yes! This entry was posted in News on May 11, 2015 by Eddy. Or something like that. I don’t remember the details, but we made a video to say how great you guys totally are for watching us be stupid on the internet. This entry was posted in Extras, News and tagged smooth few films on April 6, 2015 by Eddy. Our new Leet World VLOG is here to provide a super informative and detailed look at our work flow. Granted, we had to take some liberties with the actual process, but we’re sure you’ll forgive us. We’d hate to spoil any of the show, obviously. This entry was posted in Extras, News, TheLeetWorld and tagged leet world vlog, season 3 on March 18, 2015 by Eddy. I wanted to make a short update to let everyone know that yes, things are still moving along with TLW Season 3. We are currently hard at work on Episode 2 and moving into production stuff on Episode 3, plus a surprise that should be making its way around these parts soon. We’re sort of at a stage where we can’t show much of anything of value to you guys. It’s a tough place to be when you don’t want to spoil anything or give much of the premise away before it’s time. Soon we’ll be able to give you guys actual footage, but until that moment we’re intentionally keeping a tight lid on things. First impressions are important. After that happens, expect us to show our hand a bit more frequently. February/March have been incredibly busy for all of us on a personal and professional level. The guys got slammed with some big jobs out in LA and I’ve got a baby coming almost literally any minute now. When we’re that busy, our free time goes to the show, and stopping to make some more behind the scenes content actually delays production. Which is sad, because I love doing it! We’ve sort of gotten addicted to CS: GO again. Nick and I especially have been watching pro matches, and are looking forward a great deal to Katowice later this week. This is a problem. So, just wanted to give you guys a quick shout and let you know that yes, us and the project are still alive. More to come soon. Back to faceposing. This entry was posted in News on March 11, 2015 by Eddy.